I was sad to learn that Posterous, an easy-to-use blogging platform, will be shutting down at the end of April. It’s not unexpected news, since Posterous was acquired by Twitter in 2012, but I’ve enjoyed using it for the past few years and hate to see it go. Personally, this news meant that it was time for me to find a new home for my photo blog, where I post random snapshots from my life via my cell phone camera. Fortunately, though, the transition was an easy process. 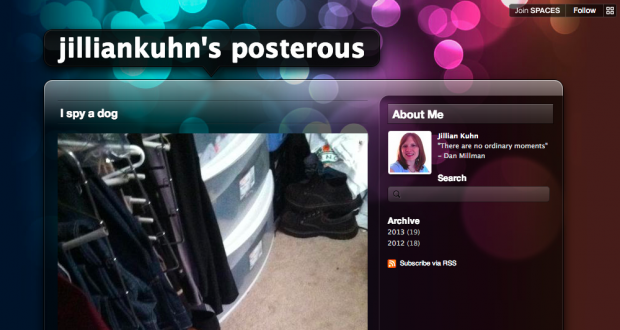 I was able to export my Posterous posts, create a new pics.jillianwarren.com subdomain, and port the Posterous posts into this new WordPress blog. It’s nothing fancy (to be honest, it’s largely shots of my dog), but if you ever want to peer into the random goings on of my daily life, check it out.